Our Family Tree Roots are Getting Deeper! Rick and I are always excited to hear from our Giorgio famiglia but especially last week when Irene George Veri wrote that she’d found another relative. Not just any relative mind you, but one who’s been doing genealogy research since the 1990s! No surprise – it didn’t take long for me to call our new “cousin” Wilberta Illig DiVincenzo. Irene’s mother, Mary Giampaolo was about 16 – 18 years younger than her older sisters Marianne (1880 – 1945) and Amelia/Emilia (1882-1955). Both of her older sisters were born in Castel di Sangro, Italy and emigrated to Pennsylvania in the late 1880s with their parents. Wilberta’s mother Angeline (born in 1920) was the youngest daughter of Amelia, whose married name was Mariani. The reason Wilberta would have information about the Iacobuccis is because her grandmother’s older sister Marianne Giampaolo married Joseph Iacobucci. Joseph is Custode’s older brother and he lived in New Castle so perhaps in some of her research Wilberta may have accumulated some information about the Iacobucci family. Just maybe – if we’re lucky – it’s possible – you never know. Just maybe she’ll be able to provide new information about our family. Just maybe . . . she might. Ummm. . . boy howdy did she! So other than being incredibly excited that Rick and I might one day be able to see the church where his great great grandparents were married, I was equally excited to see that our grandmother Custode was named after her father’s mother – Custode Carlone Iacobucci – who worked as a spinner in Castel di Sangro, Italy in 1857. I have always loved the name Custode so of course I think it is cool that our Custode was named after her grandmother. I’m also excited to have a new name to research – Carlone. 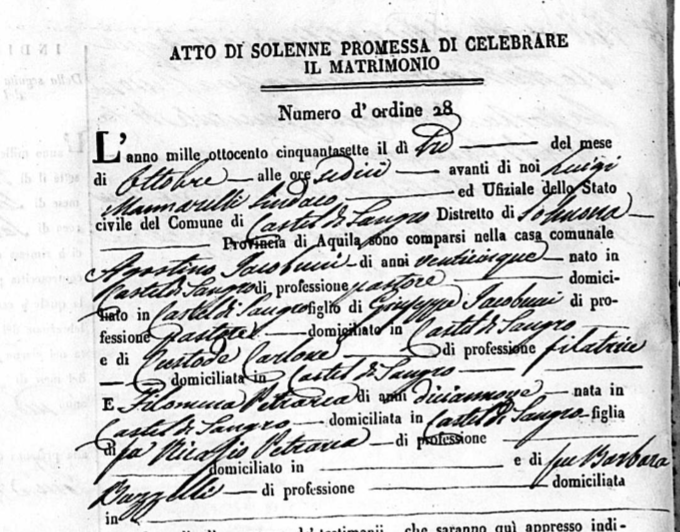 Italian marriage records have a lot of information about the families of the bride and groom. In addition to listing the groom, Agostino’s profession – a shepherd, and age (25) we learn that his father Guiseppe Iacobucci was also a shepherd. We don’t learn as much about the bride’s family because both of Filomena Petrarca’s parents were dead when she married (at age 19) which in and of itself adds a bit of sadness to the story. We do learn their names – Nicasio Petrarca (her father) and Barbara Buzzelli (her mother). Aha – didn’t have to go too far back to find the Buzzelli connection. This might explain why Rosallia Iacobucci’s first husband was Peter Buzzelli. It was not unusual for second cousins to marry. So I’m beyond excited to extend our family tree a generation further back. When I mentioned to Wilberta that Adriano’s first wife was from Castel di Sangro and was named Marianna Frattura – she recognized the name and said she had some Fratturas in her family tree. Rick has commented on this before but isn’t it interesting that all three of Adriano’s wives were from Castel di Sangro, a small mountain community mid-way between his town of San Vito Chietino on the Adriatic and Naples, on the Mediterranean. I’m curious if there was some family connection between the two towns or if he was just passing through when he met his first wife. The mountain scenery must have agreed with him because it seems to be the last place he called home. Alas – he still holds so many secrets but I’m not giving up. Yes Irene – you were quite right to suggest that Wilberta DiVincenzo might be able to provide some information about the Iacobuccis. Quite right indeed! Many, many, thanks to both of you. The brides parents names are on the last two lines. You know they are deceased by the “fa” and “fu” that precede their names. The letter in Nicasio that looks like a cursive “f” is actually a lower case “s” back then. In a recent email I mentioned to Irene George Veri that I wish I could have met her father. I usually form an idea of what a person is like (rightly or wrongly) from what I read in the old newspaper accounts about that person. Everything I’ve read about Nick George reveals a kind and loving man whose family and community were of primary importance to him. Irene mentioned that her father used to dictate song lyrics to her and she would write them down and mail them back to him. This was a way of documenting the date the song was written for copyright purposes. I wonder if Irene still has any of those lyrics? When I came across this poem, published in the New Castle News on March 29, 1969, I could hardly wait until March to post it. Based on last night’s torrential rains and thunderstorms here in Greensboro, NC and the predicted dip to low temps in the 20s this weekend (after a ‘wacky’ month of early spring) I’d say Nick captured the vagaries of March weather perfectly. Today is Irene George Veri’s birthday!!! Happy birthday Irene. I wouldn’t be able to do what I do on this blog without your fantastic memory and family stories that offer so much background on the George family. And did I mention pictures? Here are just a few to highlight your special day! Maybe you can add some comments to tell us all a bit more about them. Is this one with the piano in the background at your parents’ house in New Castle? And here are a couple more in honor of our birthday girl. Where are you going all dressed up? Is this your front porch in New Castle?